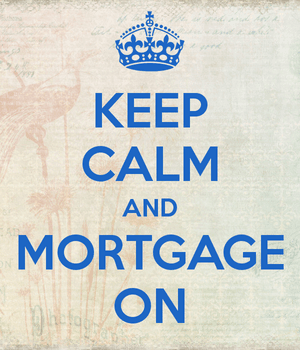 Not every mortgage application makes it to the finish line. In fact, lots of mortgages fall out of the pipeline early on for a variety of different reasons. Sometimes it’s the customer who has a change of heart, and other times it’s the lender that says no. Amazingly, nearly 20% of the mortgage applications in the Miami metro area were denied last year, per HMDA data parsed by MarketWatch. Of the 15,887 mortgage applications received, 3,086 were flat out denied by the lender. That represented a 19.40% denial rate, the highest in the nation. And well above any other metro area in the United States. For the record, this only includes conventional mortgages on owner-occupied dwellings, so FHA and VA are excluded, and perhaps jumbos too. As for why Miami leads the nation in mortgage denials, it could be a variety of reasons. For one, it was especially hard hit during the mortgage crisis, and one of the worst areas in terms of foreclosure counts. This meant a lot of borrowers who owned homes may not qualify for a subsequent mortgage because of the prior blemish, though after enough time passes they could qualify as boomerang buyers. Of course, that requires years of healthy credit habits to offset the damage involving the foreclosure. Additionally, there are a lot of condos in Miami, and denial rates tend to be higher on such properties versus single-family homes because of additional requirements like occupancy rates and homeowners’ association issues. Yes, you can be perfectly fine as a borrower, but if the complex has some outstanding issues it could leave your mortgage homeless. Another issue on the property front has to do with rapidly appreciating prices. While a buyer might be willing to pay top dollar for a home, an appraiser may balk at the lofty valuation. If it comes in low and the borrower isn’t able to increase their down payment or LTV, the loan could be DOA. In Miami, the most common reasons for denial were insufficient collateral and a high debt-to-income ratio, each accounting for about a third of denials in the area. The collateral issue was nearly double the 18.3% rate seen nationwide. Nearby Tampa Bay experienced the second highest denial rate (12.60%) in the country last year, likely for similar reasons mentioned above. The New York, Jersey City, White Plains – N.Y., N.J. metro (12.30%) was the third most common place to be denied for a mortgage, followed by Las Vegas (11.60%) and Los Angeles (10.20%). Conversely, the Minneapolis, St. Paul, Bloomington – Minn., Wis. metro was the least likely place to get denied by a mortgage lender last year, with a denial rate of just 5%. 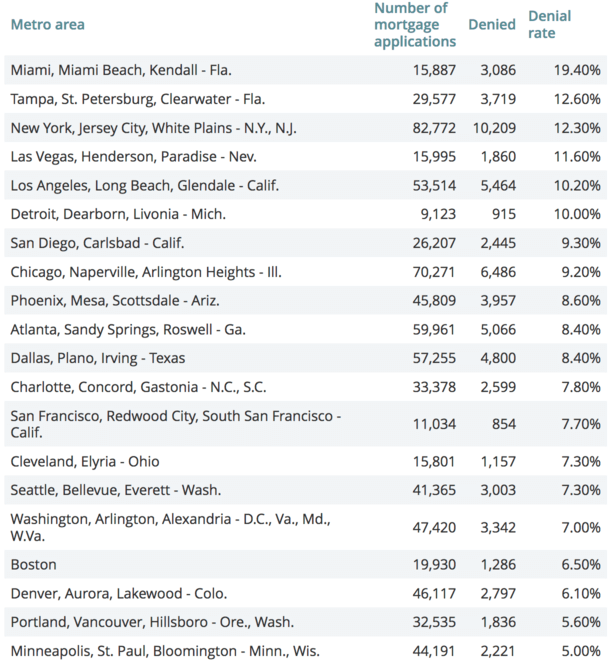 Of the 44,191 applications reported, just 2,221 weren’t approved. In the Twin Cities area, conditions seem to be the exact opposite of South Florida. In short, speculation didn’t run rampant and as such, home prices didn’t get out of control. That meant fewer buyers overextending themselves and less foreclosures as a result. Homes are relatively cheap there so it’s harder to get into trouble. Other winners included Portland (5.60%), Denver (6.10%), Boston (6.50%), and the DC area (7%). I’ve already written extensively about the many reasons why mortgages get declined. It might help to review before applying for a mortgage to at least knock out the obvious ones and boost your chances of approval. It’s impossible to guarantee mortgage approval because every property and borrower are different, but you can certainly increase your success rate by avoiding common missteps and doing some preparation prior to the loan process.